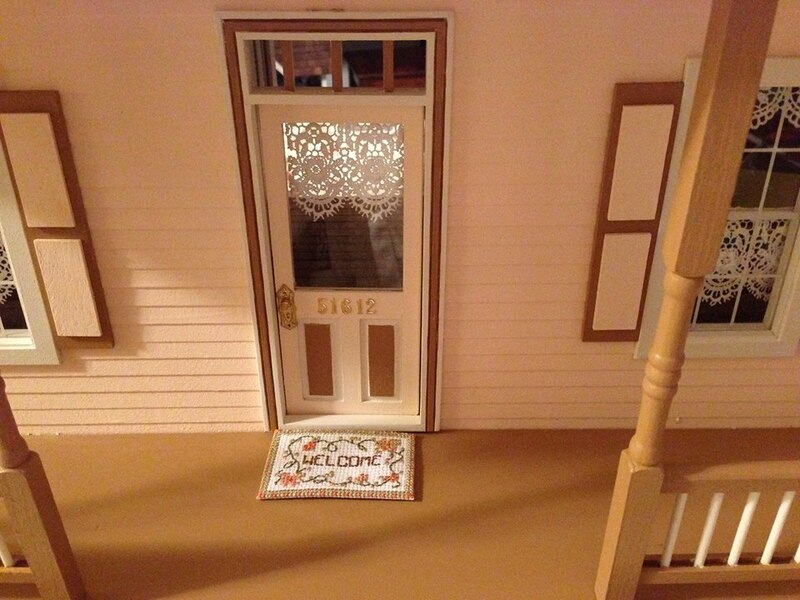 This is Halli's House, built as a birthday gift for a friend's granddaughter. The gingerbread trim was omitted, new doors were added, a larger foundation was included, and the staircase was upgraded. The house was completed in a peach color. 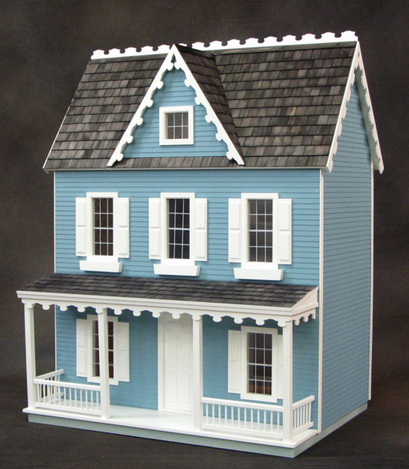 Trim and shingles have yet to be added. Halli's name is displayed on the heart beside the door. The house number is the new owner's date of birth. 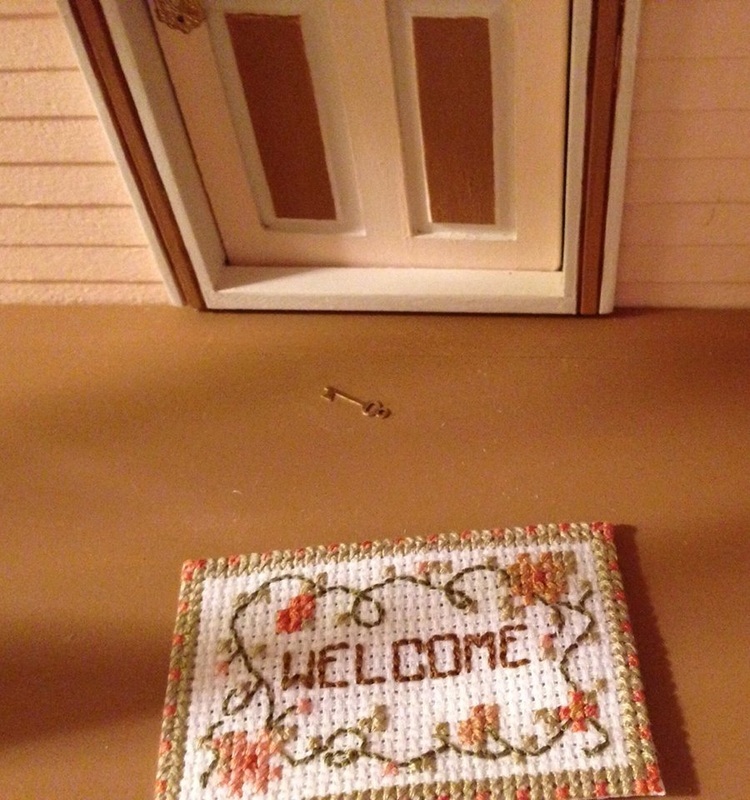 I designed the welcome mat to work with the colors of the house. 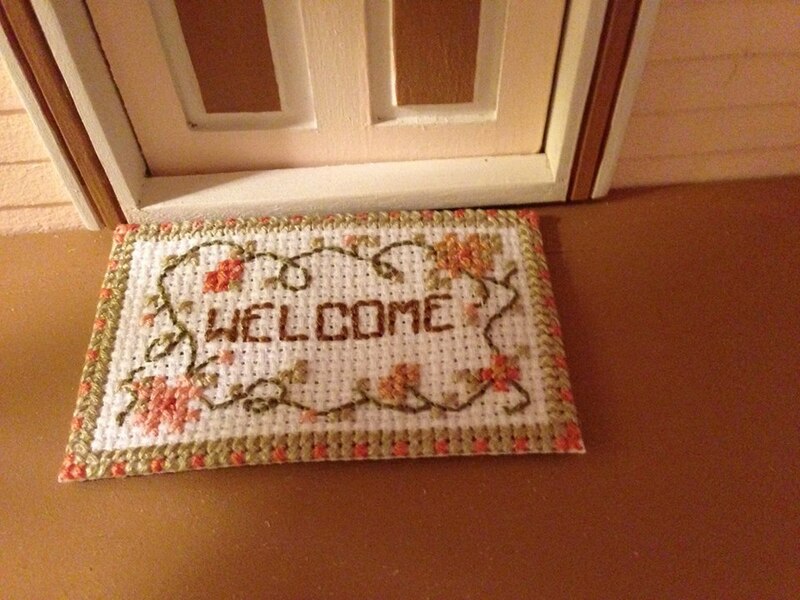 I glue a key under the welcome mats in my houses. Another key is placed over the front door facing. 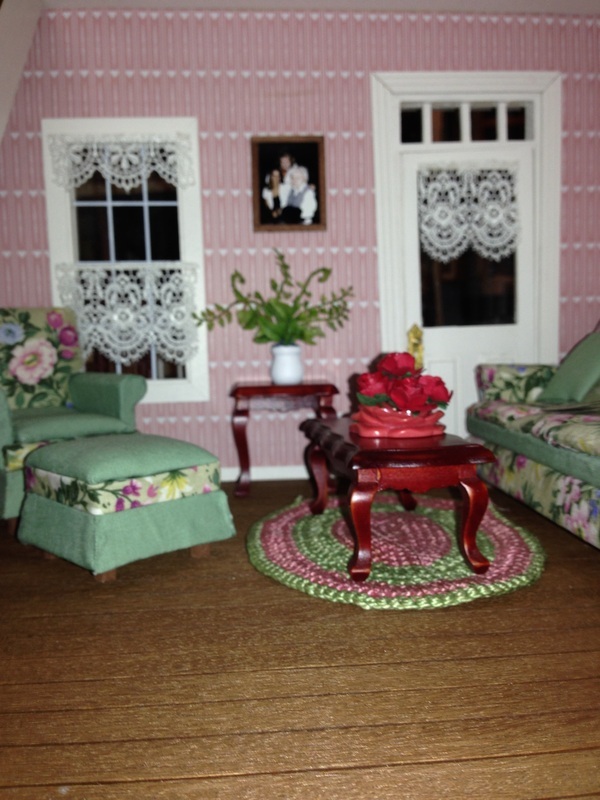 The interior was completed with wallpaper supplied in the kit wit the exception of the attic. 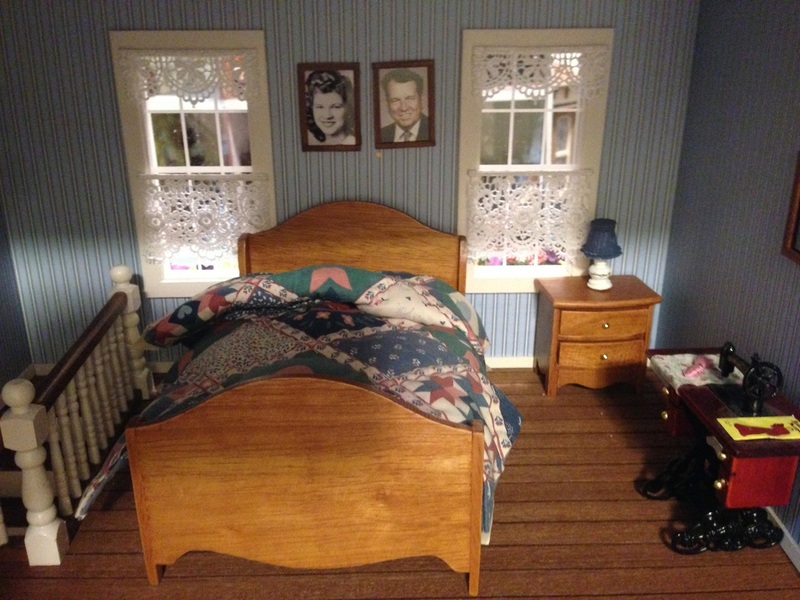 The house contains a parlor and kitchen, upstairs bedroom and bath, and a nursery in the center of the third floor. The rest of the third floor contains the attic rooms. Since the grandmother is a history teacher, she can teach the new owner 20th century world history from the wallpaper headlines that line the attic walls. Three generations are framed in the parlor. I recovered the furniture to fit the room decor. I love these louvre doors that lead into the kitchen. The calendar on the wall depicts the month and year the house was built. A picture of Halli's grandparents were included in the calendar. Family photos adorn the house. Pictures of Halli's great-granparents hang in the bedroom. A mini copy of paintings created by Halli's grandmother are found in the attic. Baby Halli hangs in the nursery. Halli's great-grandfather was a musician. I tried to paint the guitar to match her great-grandfather's guitar in the picture.